Served: Pint glass from a 12 oz. bottle. Purchased at Julio’s for $8.99/6-pack. I’m back! After a 13 month hiatus, the brew reviews can continue. Many travels, job searches, hopes and fears have come to pass, but the love of beer continues. Many thanks to my sister Megan for setting up the new domain for me. Now that I’m back in the saddle, I’m planning a mess o’ beers I’ve never tried before. To the review! Who else but Smutty would I kick off the brew reviews with. 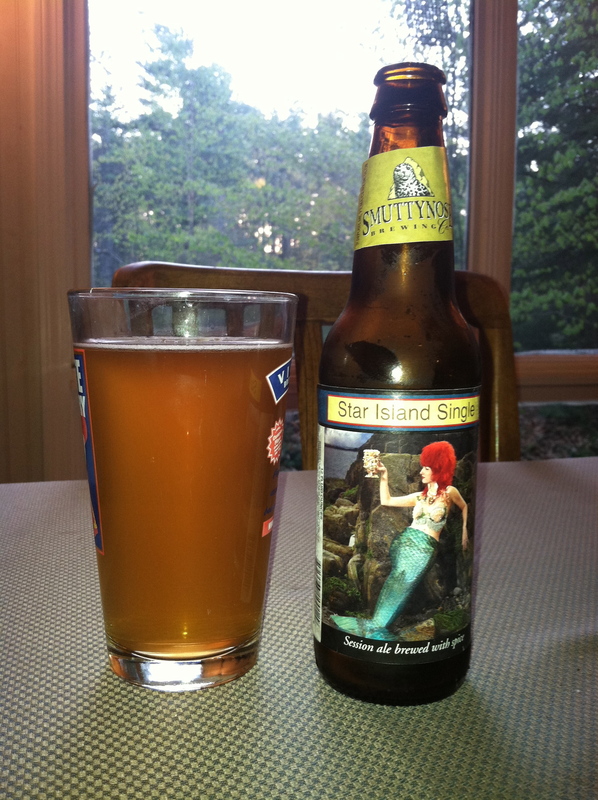 The Star Island Single was an offering just then filtering down to consumers when I went AWOL on the blog. I tried a sip at Bert’s last spring, but hadn’t actually sought it out again until this week. The ale pours a hazy burnt orange with a wafer-thin white crown that fizzles quickly. The aroma is excellent, with mild citrus and bread. Very nice on a warm day. The taste is very fulfilling, with medium dryness, spices, subtle hop presence, and a clean finish.